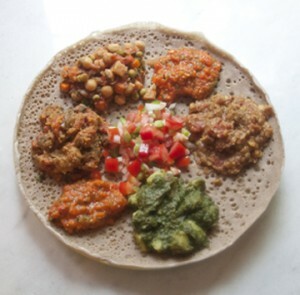 VegBoone is offering a delicious Ethiopian feast in exchange for member support. VegBoone member and talented chef, Danielle Bussone, will be preparing this dinner to help us with the costs of running VegBoone. (These include fees for: the Meetup software, printing, literature offered at events, and venue rental.) The cost of the dinner is $10 per person (non-refundable) and we will be selling tickets at the events scheduled before October 9th. We would really appreciate payment in advance, but will accept payment at the door if there are any slots available. Here is Danielle’s description of the dinner. Ethiopian cuisine hails from a long vegan tradition dating back to the fourth century. The Coptic Church was the dominant religious sect imposing religious fasts in which no animal products were allowed to be consumed. 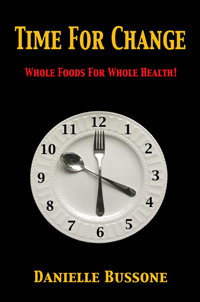 There are numerous fasting days in Ethiopia, the longest fasting period coincides with Lent. At this time a larger array of vegan options are available in Ethiopian kitchens across the country. The food is served without utensils. A plate begins with a large, spongy, semi-sour pancake called injera made from a nutritious Ethiopian grain, teff. The injera covers the entire plate in is somewhere between the consistency of a pancake and a crepe. On the injera is spooned several flavorful stews called Wat. Ethiopian food is generally very, very spicy. This meal will be spicy as well but not nearly as hot as true Ethiopian cuisine. Another injera is rolled up like a rug and is served with the plate of stews. To eat this, you tear off a piece of the rolled-up injera and fold it over one of the stews, pinching a portion within the injera. Then, like a baby bird being fed by its mother, you lift your chin and drop it into your mouth. It is so delicious! It is made with fresh vegetables, dried legumes cooked with Ethiopian spices, and little or no fat. I like to add a tomato salad in the middle of the injera to use as a palate cleanser between bites of Wat. When you have used up your rolled injera, you begin eating the injera on your plate. This is the most delicious part as it has absorbed the flavors of the various stews.